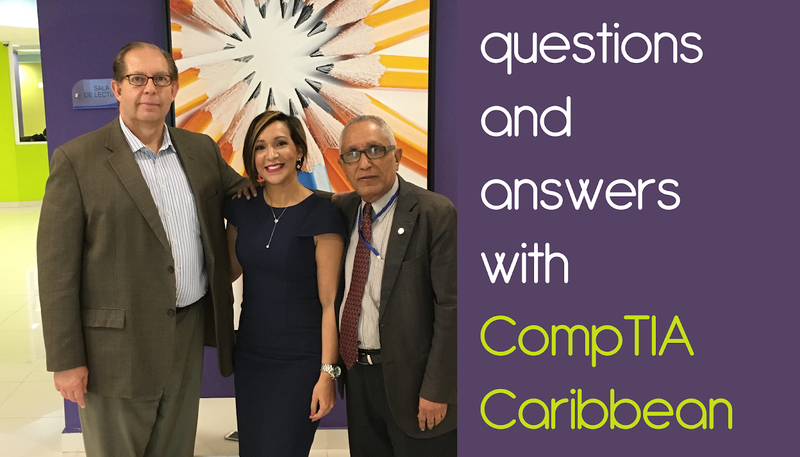 Does CompTIA have a physical presence in Trinidad or the Caribbean? CompTIA does not have a physical presence in the region. We have a network of learning partners and I visit the region to support the learning partners and build awareness of CompTIA, the association, and of the value of CompTIA certifications. We can touch many more people through our social media communication and our learning partner network than having a physical presence someplace. I visit the region frequently when invited and when there are opportunities to increase the awareness of CompTIA. In fact, I already have plans to visit Trinidad in May and Grenada in June, and I know that I will be visiting the Bahamas, Puerto Rico, and Jamaica. I’m writing this message to you from the Dominican Republic and we already discussed my return in the near future. Are there any stats for the region that you can share? Someone from every island in the region gets certified every year. CompTIA has local authorized learning partners in the Bahamas, Jamaica, Puerto Rico, Dominican Republic, Haiti, St. Vincent and the Grenadines, Grenada, St. Lucia, Trinidad & Tobago and Barbados. CompTIA certified professionals are hired by Digicel, Clear Harbor, GBM, Fujitsu Caribbean and other regional companies in the Caribbean, and by global IT companies such as Ricoh, Dell, HP, and Xerox. As a combined region, the Caribbean ranks in the top 10 certification consumption markets for CompTIA. Why are there no web developer or mobile app developer related CompTIA certs? Developing any kind of software development certification is an extremely difficult task because of the scope of such a certification. CompTIA tried multiple times but it just becomes overwhelming. CompTIA develops certifications in response to the needs of the IT industry, and we haven’t been pressed for these types of certifications as we have for the infrastructure support certifications. I read somewhere that CompTIA is "vendor-neutral", can you expand on this? "Vendor-neutral" is what makes the CompTIA certifications unique. Not only are the certifications "vendor-neutral" but CompTIA, the global IT association, is "vendor neutral", meaning we are not influenced by any company or government. CompTIA is an independent association. "Vendor-neutral" means that CompTIA certifications focus on the skills that are needed by the IT industry not the product. By focusing on the skills CompTIA is responding to what the industry needs in IT professionals … skills. An excellent example, is the CompTIA Cybersecurity Analyst (CySA+) certification that was launched in 2017. It focused on the skills needed for the relatively new "security analyst" position that appeared in the global IT industry about 2-3 years ago. The "security analyst" must be able to use the new analytical tools that have been developed to find the new security threats such as "Advanced Persistent Threat" (APT), where the intruder sits inside the infrastructure watching and gathering data. Security Analysts use new tools to find aberrations that can point to an APT and other threats. No other certification does this. The focus is on the skill, not a product. Another certification is the new CompTIA Cloud+ certification that was launched in January. It was completely re-vamped to reflect the new jobs and the new skills that are now needed in the data centers … not on a specific cloud product. It is the first step before going into product specific cloud programs. As a result, a CompTIA IT professional has the skills to work with products from every manufacturer in any IT environment, globally. This makes CompTIA certifications an excellent investment for companies and individuals. Also read that CompTIA is "non-profit", why so? CompTIA is an association and created as a non-profit organization under the US tax code. Here is a hyperlink to our story. CompTIA is the only global IT association for the IT industry and for the IT professional. Nobody does what CompTIA does. Can you talk about the "industry studies" that are released annually? CompTIA has a research department dedicated do studying trends and the state of the global IT industry. Our goal is to keep the industry informed. Here are two very interesting reports published in 2017 about some key megatrends, Building Digital Organizations 2017 and A Functional IT Framework. Every IT professional needs to understand and be aware of these trends because what is very clear is that just being technically competent isn’t enough. You need to understand all aspects of the organization for which you work including accounting, finance, marketing, logistics, products, etc. Here is a hyperlink to find other CompTIA research. CompTIA’s mission is to be the "go to" place for information about the global IT industry. How long does a certification last for? It depends on the certification. Most CompTIA technical certifications need to be refreshed every three years. CompTIA Project+ and CompTIA CTT+ are good for life. Here is a link to understand how to keep your technical certifications active. Are there any future certs coming from CompTIA? Yes, we are very excited about the impending launch of the CompTIA PenTest+ certification later in 2018. Here is a hyperlink to the information page about this certification including information about the beta exam that will be launched on January 31. Contact me in a month and I will have much more information on this certification. Additionally, monitor the CompTIA-Caribbean Facebook page and LinkedIn group to find announcements in future information. Other certifications will see updates launched this year. What advice is there for students preparing for a CompTIA exam? Self-study should not be the first method of study to prepare for an IT certification exam. We know statistically, that over 70% of the people who use self-study are not successful. CompTIA certifications are very comprehensive professional certifications and many people underestimate them. I would only recommend self-study for a working professional with a minimum of 1 year of active IT work experience. If you do self-study, invest in good, published study materials. The easiest way to find them is to contact me and I can point you in the right direction. Be careful of "free materials" and "samples". They are not complete and probably wrong. Look for a CompTIA Authorized Learning partner. Yes, unfortunately, there are "wolves in sheep’s clothing" i.e. unauthorized training programs that claim to be an authorized partner. Again, contact me for guidance. There are some excellent distance learning programs in English and Spanish for some CompTIA certifications. So, if you have difficulty with attending in-person training, you have distance learning as an option. Again, contact me for references. If you are taking a formal training course, stay away from courses that are taught in the “boot camp” style, 5 days, 40 hours in one week. This is not a best practice in instruction and you will not be ready for the tests at the end of the course. Look for programs that are delivered over multiple weeks allowing you to prepare and digest each session. Basically, when you leave the last session of the course, you should be able to walk into a testing center with confidence. Make sure the instructor holds the current version of the CompTIA certification that he/she is teaching. That is a requirement of the CompTIA program. Ask them to confirm that they are. You can contact me to confirm this. Additionally, if the training program is not using published learning materials, be aware. Every CompTIA learning partner should be using published learning materials, not home-made materials. CompTIA is now a publisher and going forward you will see more about CompTIA Official Study Materials. Always download the exam objectives for any certification for which you are preparing. The objectives tell you what is covered in the test and they are an excellent study tool. Additionally, if you are taking a class and the instructor doesn’t give you the exam objectives on the first day, ask for them. The instructor should be following the objectives to ensure that everything is being covered. Finally, when you are ready to take the test, contact me for a discount coupon. I have had an initiative now for a few years to provide discounts to anyone who is taking a CompTIA certification exam. CompTIA certifications are globally recognized professional certifications. They are difficult and require hard work, but they also prepare you for your job and get you the interview. Above I provided links to our social media pages. These are excellent resources to keep you current and to get accurate information. There are a lot of Facebook pages and other social that are misleading and many times, dead wrong. My favorite are the people who hate their jobs and blame everyone for their situation, influencing young, uninformed people by their narrow-mindedness. If you want to know about CompTIA, go to an official CompTIA page. Finally, my job is to help new and current professionals grow in their careers. I am here to help.